As a senior executive of a brokerage firm I felt a real frustration not being able to understand the motivation of millennials. I’m not new to the millennial’s, I’ve worked with them throughout my career and would like to see more members of the Generation Y cohort enter and succeed in commercial real estate. Brokerage is all about long-term relationships and the sooner you start in the brokerage business the longer the runway you have to build a strong brokerage career. In the past recruiting millennials has not been easy. 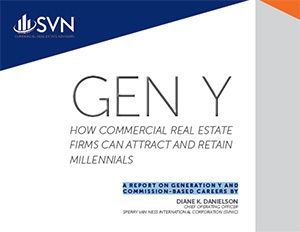 This report Gen Y: Generation Y and Commission-Based Careers written by SVN’s corporate research department sheds a lot of light on the topic of what motivates millennials and what they are looking for in a career. In a nutshell millennials want a collaborative environment, an entrepreneurial culture, high earnings potential, training programs, flexible work hours, and a degree of autonomy. These are all things that a brokerage firm can deliver relatively easily. We hope you enjoy reading this article and welcome you to the inaugural article of the Strategic Broker.